Last month, we visited the Sydney Bus Museum in Leichhardt and were spoilt by hopping onboard a Vintage Double Decker Bus from the QVB to the Sydney Bus Museum. The kids and specifically little Mister, were smiling and laughing at the bumpy yet awesome ride from the top deck. It’s a nice drive to the Museum where passengers can have a look around the city and go across the Anzac Bridge. When we arrived at the Museum, the kids’ eyes popped as they saw the vintage buses in the warehouse and so did I! There’s nothing better in my mind than preserving these great vehicles from the past. The Sydney Bus Museum is a great Museum for kids as they can pretty much touch everything and get on most vintage buses and drive them at the exception of some buses where notices have been written to make sure some of the buses’ old mechanics are preserved. The back wall of the 100 year-old tramshed consists of some information about the museum and the buses onsite and a video to show visitors. 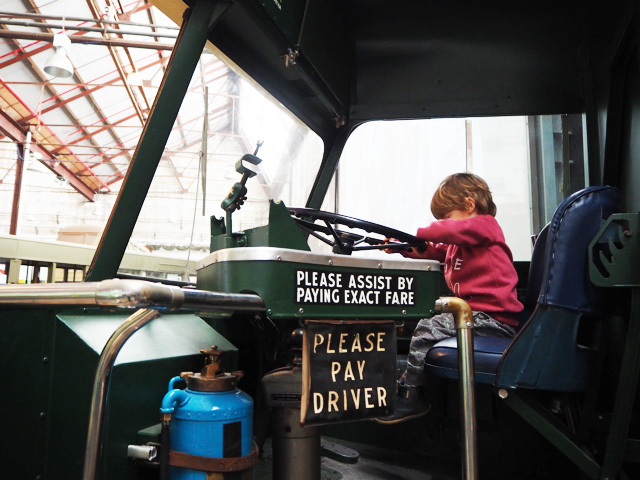 Visitors can explore the rest of the Museum by hopping on each bus and pretending to be a driver or passenger. There are quite of few buses so it might be hard to pick a favourite. The kids and other families on the day loved wondering around and hopping on the different buses and other vehicles onsite and especially the English double decker bus. Once we walked around the Sydney Bus Museum for over an hour, we caught a vintage bus back to the city to top the experience! We had such a great time at the Sydney Bus Museum. The Museum is run entirely by volunteers and open the 1st and 3rd Sunday of each month, check the Museum’s website (below) for more information, upcoming events and special themed Sundays. The Sydney Bus Museum is located at 25 Derbyshire Rd in Leichhardt. The Sydney Bus Museum is open every first and third Sunday of the month 10 am to 4pm. Ticket prices are: Adult $15, Child (4-16) $10, Concession $10 - Companion and Seniors cards accepted and Family (2 Adults / 2 Children) $35. Each ticket includes all day entry to the museum and a ride aboard a vintage double-decker bus to Queen Victoria Building and return. The Sydney Bus Museum is located at 25 Derbyshire Rd Leichhardt, access from Norton and William Streets only. Please note there is limited parking on site. Disabled parking is available. There are toilets onsite with a change table in the disabled toilets. For more information on the Sydney Bus Museum, head to their website. Busy City Kids were invited to the Sydney Bus Museum for the purposes of a review. All opinions & feedback are genuine & truthful. Food and travel were self funded.